3 Bedrooms, 4 Baths, Sleeps 7 encompassing 1800 Square feet of living space on two levels. This lovely, cozy beachfront villa features two decks overlooking the beach, only steps away. 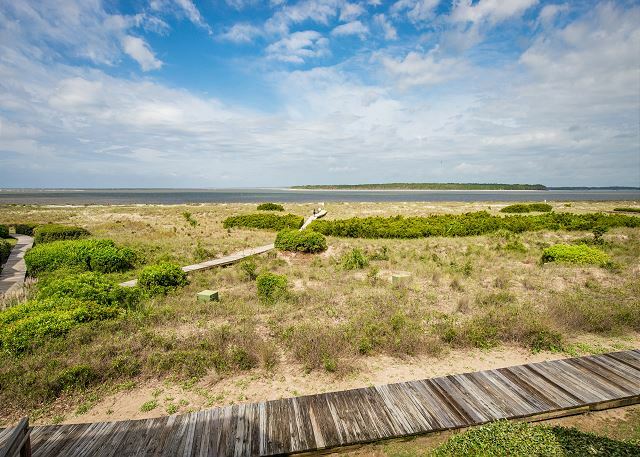 The ocean front decks provide great views of dolphins, deer and gorgeous sunsets. 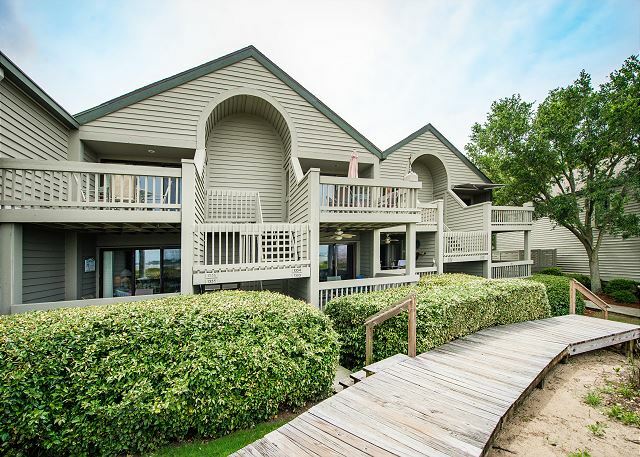 The Seabrook Island Club is within walking distance where you can enjoy golf, dining, and 2 pools. Your amenity cards are FREE and included with your stay. This beautifully remodeled villa has 3 bedrooms and 4 full baths and many custom touches including a hand painted mural that greets you at the entrance and free wireless internet. Upstairs the living/dining room and kitchen face the ocean. The living room is equipped with a new large sleeper sofa, comfortable wicker chairs, and a 48 inch smart TV equipped with a DVD. The sleeper sofa in the living area can accommodate one person with an extra full bath nearby. This villa has two master suites, each with new king beds. The master suite downstairs is a large suite that opens onto a covered deck overlooking the ocean. Cozy and intimate, this suite features a large jacuzzi tub and separate tile shower. The third bedroom has two new single beds ideal for children but also suitable for adults. Each bedroom is a large suite with a full private bath, double vanities and equipped with flat screen TVs. Enjoy the best 3 bedroom rates on the beach, free amenity cards and the best service for you vacation! Our stay was perfect. Condo clean, spacious and perfectly located. We hope this experience was the first of many. It was a very good experience. We love Pelican Watch and the 3 bedroom unit was just right for our group. Loved our condo. The kitchen was small but well equipped. Bedrooms were nice sized and it was good not to share bathrooms. The ocean view was lovely. Watched dolphins daily plus spotted an eagle twice. Within walking or biking distance to the pool. There were a couple beach chairs which were appreciated, but do bring your own beach towels. We would definitely stay there again. Another wonderful family vacation in this great Pelican Watch villa!! That to use Gym & indoor pool it would cost $15 per person per day. Very good experience with people and unit. No big issues. Had one small issue with plumbing that was fixed expeditiously. Pelican Watch Villa - perfect location and 3 bedrooms! Beautiful and spacious villa! Location couldn't have been better! We plan to rent again next year! I highly recommend this rental. The view is terrific, the rental well maintained and well stocked with the utensils and needed cookware for any need. Excellent response from the rental agency as well as the owner. Beautiful sunsets and glorious beaches! 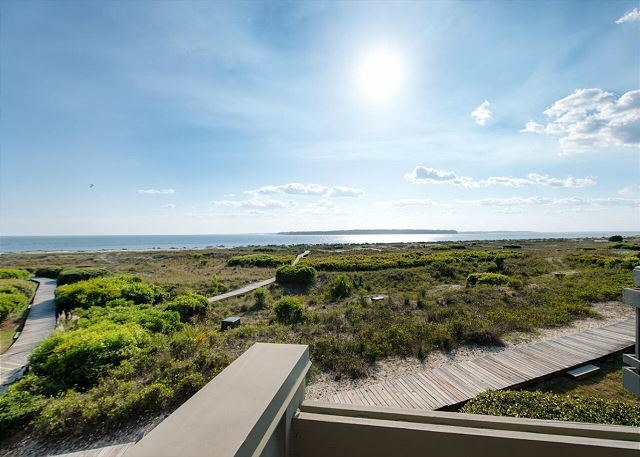 We love SEABROOK--and always enjoy Pelican Watch villas. This one doesn't compare as favorably as others we've stayed in--and over 30 years, we've stayed in many! Decorating is mired in the 80s...get RID of the carpeting! The kitchen desperately needs updating to match the two-floor unit (that is great, by the way!). BUT...the tiled counters reek of being dirty and germy. The tiny kitchen belies the potential in that unit! We see it's for sale...someone will pick up a gem, for sure! The outside sliders DESPERATELY need to be replaced. But you can't beat the location. The walk to the beach and the beautiful sunsets are OUTSTANDING!! Will come back to Pelican Watch!! Very friendly, professional and attentive staff. They tokk care of any complaint that might arise. The only problem was the condition of the roads and sidewalks after the ice rain and snow. Although it was icy, extremely slippery and dangerous the maintenance crew at Seabrook Island did not even sand the sidewals, let alone the roads. This needs to get better. Everything was clean and comfortable. Nice place on ocean. Would recommend this to anyone. What a beautiful condo with a great location. The beach was awesome. The entire Seabrook area is clean, beautiful and peaceful. Great place to ride bikes. A place we want to visit again! After travelling from the UK for our sons graduation in Charlotte NC, we decided to extend our vacation and visit Charleston SC. 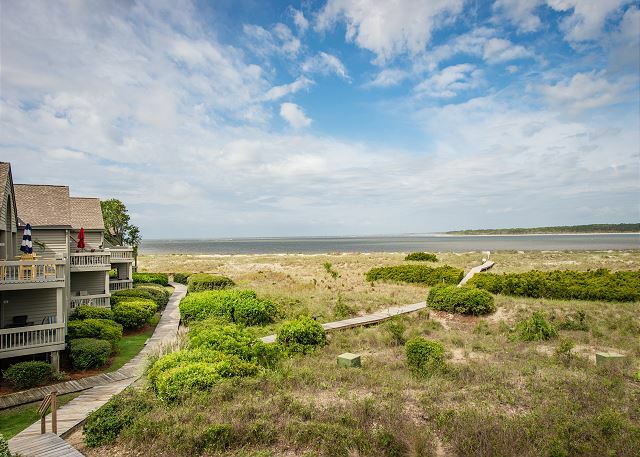 We chose to stay on Seabrook Island and selected Pelican Watch Villas. After making contact with owners; Bill & Susan, we knew we had made the right choice....even before we had arrived there!!! Bill could not have been more helpful. We had frequent communications and being typical Brits on holiday, had many questions about the Villa and surrounding places of interest. Bill responded to every email and we had several chats on the phone. Where the history of Charleston is concerned (which is a must see place), forget the history books, just ask Bill, as he certainly knows his facts where this city is concerned. We were fortunate to actually meet and have lunch in Charleston with Bill & Susan, spending a few hours talking about the local area. Pelican Watch Villas are simply the perfect place for a family holiday, or for a romantic get away. The accommodation was spotlessly clean and well presented. The furnishings are very comfortable and we found everything we could have possibly wanted in the property. There was considerable attention to detail where this property is concerned. The bedrooms and en suite facilities were of the highest decorative order, making our stay as comfortable as it could be. The beach is a stones throw away and has got to be the cleanest beach I have ever seen. Daily sightings of Dolphins, Deer, Crab and low flying Pelicans became a regular feature of our stay. There was hardly a person on the beach, which was perfect for an early morning jog or walk. The water was clear and warm; perfect for a refreshing swim. This is most definitely a place we will return to without hesitation and I would highly recommend it to anyone who is reading this testimonial. Once again, many thanks Bill & Susan, for sharing your fabulous holiday property with us. Mike & Sue Foster; Oxfordshire, England. We have stayed at PW previously in a different unit. We love the location and love having access to the club. The particular unit we stayed in was very clean but some rooms need to be updated and the kitchen was very cramped. However, I would stay in this unit again and would recommend it to my friends and family. Seabrook Exclusives was also great to rent from. Overall, we had a great vacation and experience. My family loved this place. The rooms were large and we did not feel cramped. The four bathrooms were really a plus, and the view from both decks were spectacular! Excellent location to the beach! Everyone we dealt with for are stay were excellent to work with and answered all our questions. Only issue were the tv's were not large enough for my son (told him we didn't go on vacation to watch tv!). Great rental experience! All guests enjoyed the unit. We had an issue with hot water and Seabrook sent a service person promptly who was very efficient and addressed our needs. The view is spectacular! We love Seabrook and will surely return. Betsy was very accommodating, allowing us the flexibility for early check-in. Thank you! 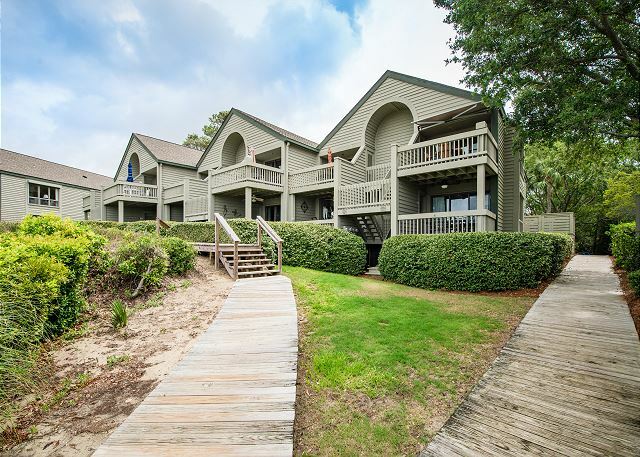 This is a 3 bdrm/4bath condo that is on the beach and a few feet from the board walk. It is well appointed and very clean. The primary living area is on the 2nd floor and may be a challenge for handicapped guests. The management is quick to respond. Pelican Watch are the best rentals on Seabrook Island! The views of ocean, beach, dolphins, pelicans, sunsets, and ospreys are stunning. The upper villas are the most desirable. We chose this 3 BR, 4 BA so each couple could have own private space with en suite bath. Clean villa and comfortable furnishings made this a wonderful stay for all of us! 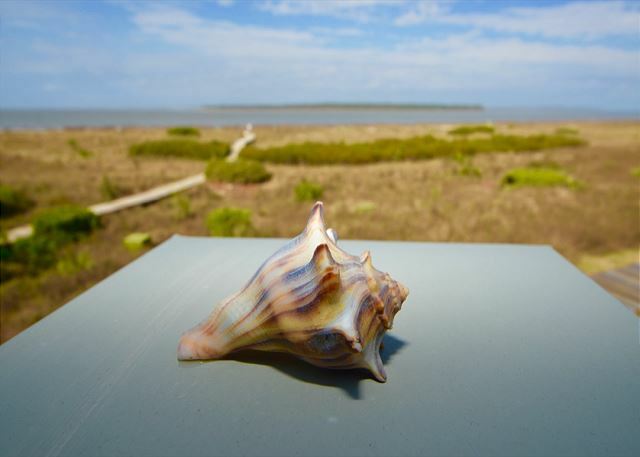 Seabrook Island has it all--beautiful beaches for walking, biking, kayaking, bird watching--a nature lovers paradise! Overall a great short break with fabulous weather, dolphins galore, and peaceful beach one on the beach in the early mornings. Heaven. I would only add that the bedspreads and linens felt very old and worn. Would recommend changing the spreads. The condo was well stocked and beautiful. The rooms were well decorated and the beds very comfortable. Overall, everything was clean and well maintained. Short walk to beach and the weather turned out wonderful. The rental company handled all of our questions and allowed us a little extra time to check out and when we forgot something they notified us promptly and made arrangements to get the itme to us in ht email. The experience was fantastic in every way from the selection of available villas to rent, on-line reservation, cleanliness and check-out. At the time of the reservation we thought the price was a little steep but it was worth every penny. Great location. Centrally located and quiet. This is the 8th year my friends and I have stayed on Seabrook Island, but the first time we stayed in 1355/56 Pelican Watch. The place was immaculate, the layout ideal for 6 women on 6 time schedules, and we are already planning our trip to the same place for 2017! For the first time ever, we had rain during our May trip, but we certainly don't blame the owner for that! We were especially charmed by the upstairs/downstairs entrances on both ends of the unit, the fact there were beach chairs there for our use, the cleanliness of the unit, and the proximity to the beach. The kitchen was a bit small (for 6 women to share! ), but we figured out a way to do so. Very well equipped, great view. We really enjoyed our stay. A price vs value winner! Great place ruined by noisy neighbors who continually slammed doors upon entry or exit and smokers as well. Had they not been early risers it may have been forgivable. Otherwise a quiet place with friendly people. This Villa was well stocked, clean and beautiful. The furniture was homey and comfortable. We enjoyed a quiet, peaceful week. As a family of runners we used the beach and roads often. The island does lack trails but roads can be used. Seabrook Island does need to enforce the speed limits a little better since walkers, runners and bikers use the roads so much. Speed bumps/humps would be a plus. We enjoyed our stay at Pelican Watch Villa 1355! Excellent location! Super clean, and very spacious, beautifully decorated villa! We absolutely love visiting Charleston. There is so much to do and we never have time to do it all. This condo was great! Clean, great location, well appointed. (Love the plethora of nice hangers! First time I had enough in any rental). Seabrook Island is fabulous. We love driving through the trees bending over the roads with their mysterious looking Spanish moss hanging down. The homes are gorgeous. 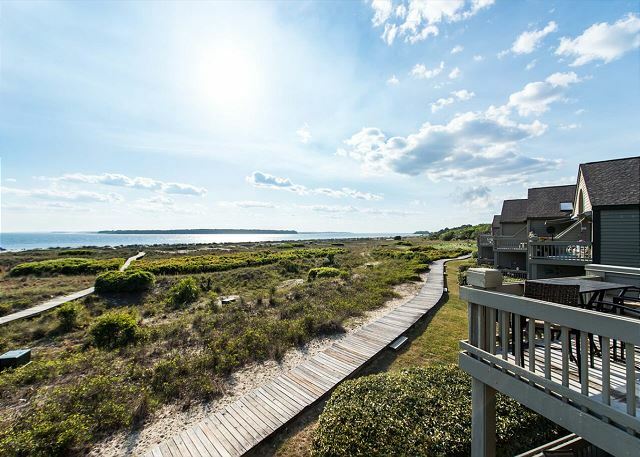 Lots to do right there in Seabrook: restaurants (WONDERFUL meal at Rosebank in the Bohicky Marina), bicycle and horse rentals, tennis, golf, and of course, the beach! Can't wait to come again!